breakfast | What's Cooking at the Genua's? Every so often we get that craving for pancakes on the weekend. But trying to watch the carb and calorie intake makes it tough. This recipe only has 4 grams of carbs per serving! No joke. And they are actually very good! 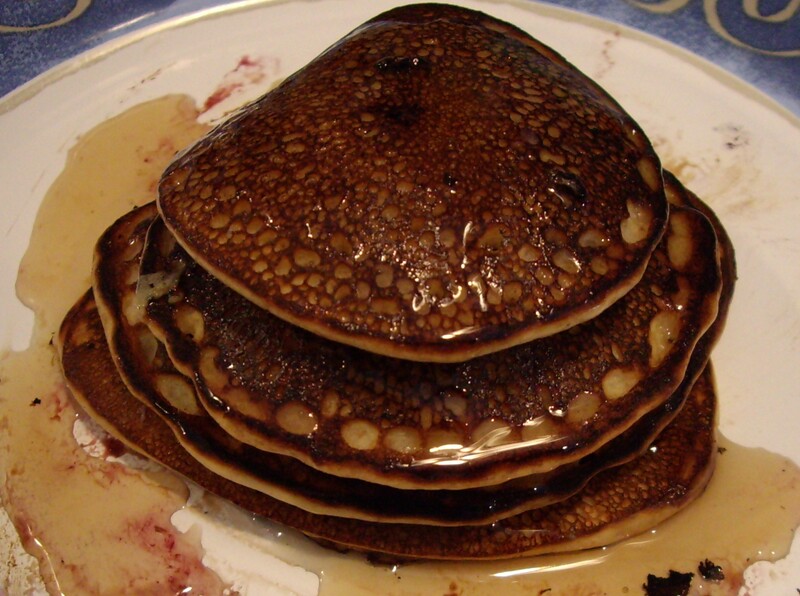 I know many of us have tried the “Atkins” pancake mix, or other low-calorie low carb mix over the years and they were all just a little on the bland side. Not this recipe, which I got from “George Stella’s Livin’ Low Carb” book. I actually use this cookbook quite a lot. This coming from a true carb hound. The recipes are great! This recipe I actually had all the ingredients so we tried them out. It actually calls for heavy cream and I didn’t have any so we used half-and-half instead and it was great. The other minor ingredient I actually did not have on hand was baking powder! So I found my ‘substitution’ chart and made my own! Just combine ½ teaspoon cream of tartar and ¼ teaspoon of baking soda. Voila, baking powder. And since I only needed ¼ teaspoon of baking powder it was perfect. 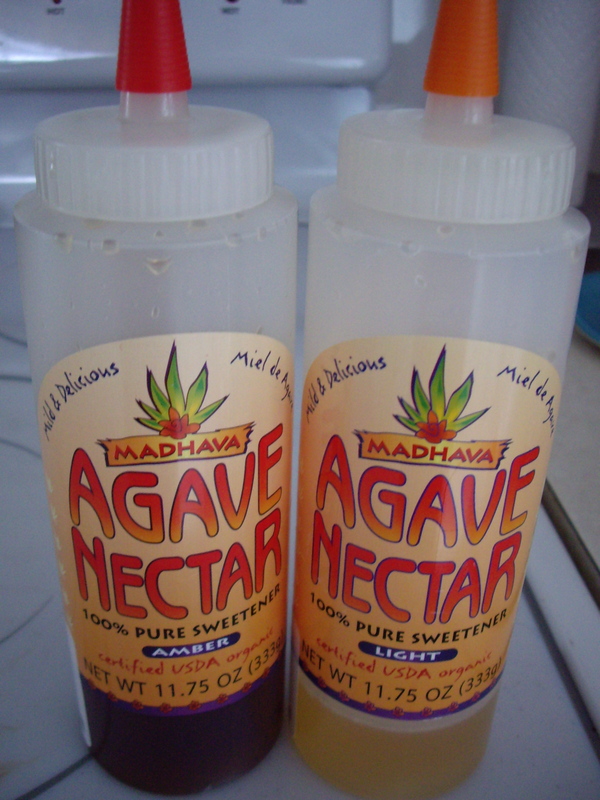 Also, usually we have the sugar-free syrup in the house for the pancakes and waffles we sometimes have, but this time we used the amber agave nectar! Delicious and so much better for you! We also have the light one as well. Found it cheap at Marshall’s! Go figure! 1. Grease a griddle or large skillet with cooking spray or butter and heat over medium heat for at least 5 minutes. The griddle should be very hot so that the pancakes don’t stick. 2. Mix all the ingredients except for the blueberries in a blender or food processor for about 15 seconds. Stop and scrape the sides and mix for another 15 seconds until well blended. 3. Pour about 12 little cakes onto the hot griddle (they should be about the size of the bottom of a soda can). 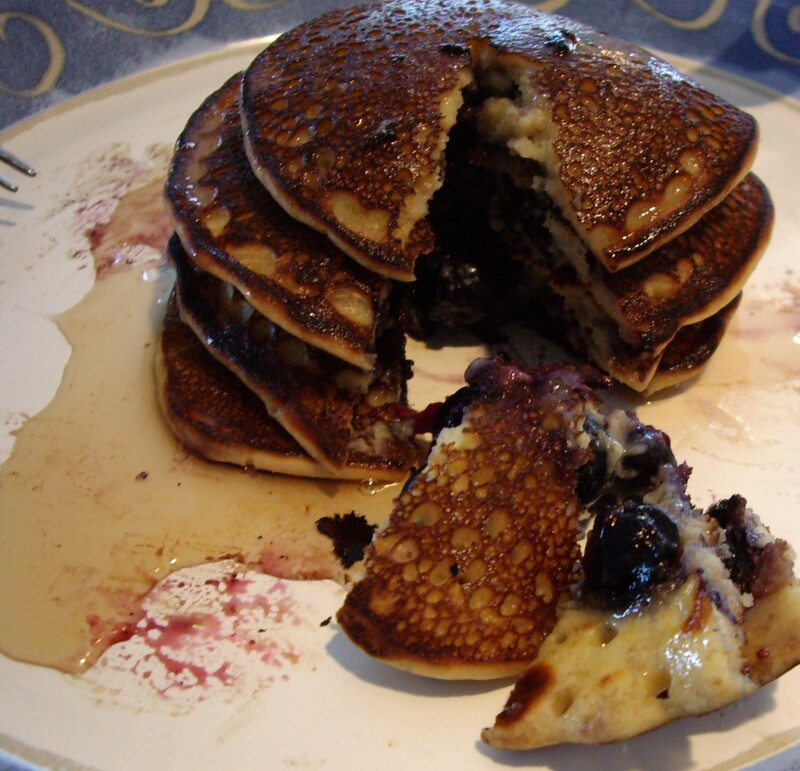 Wait for the pancakes to bubble and then sprinkle with a few blueberries on each of them. Cook for a little longer, then flip with a spatula and cook for a few more minutes, until both sides are slightly browned. Serve hot with melted butter and syrup of your choice! You may have to do this in a couple batches. Makes about 12 small pancakes. You can use other berries also just make sure you cut them up small enough to about the size of the blueberries. Last Sunday I started out making a Greek omelette then I added a few Italian ingredients and changed the name to Mediterranean Omelette. 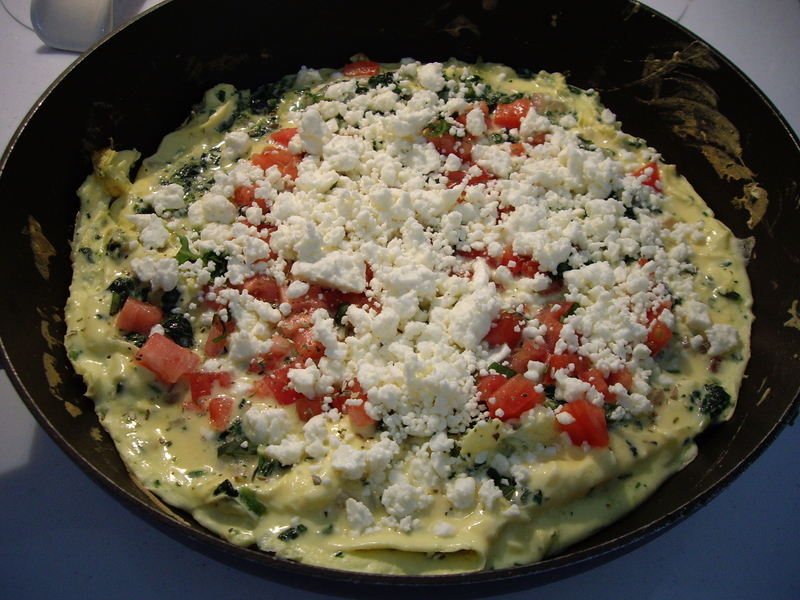 I used real eggs in this but you can, as always, use an egg substitute. Usually on the weekends I make egg salad for John but he likes it warm (yuck) and I like it cold. So this past weekend I decided to make a large omelette we could share. It was so good I wanted more. And I am not a breakfast person! Though the gyro omelettes we had in St. Augustine at Athena’s Greek Restaurant were incredible! Nothing like it anywhere! 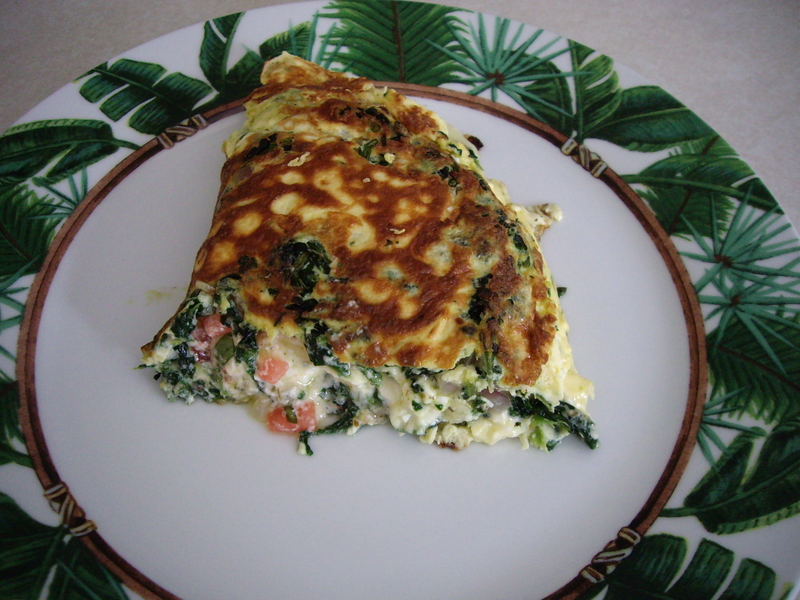 Ok I digress…This omelette was nice and easy and since we both liked all the ingredients I could make it in one pan and just split it. 1. Beat the eggs and half and half till light and fluffy. Set aside. 2. Heat a medium skillet and add butter and olive oil. Melt on medium heat till a little bubbly. 3. Add the onion and sauté till soft. (A few minutes) Add garlic and sauté a few more minutes. 5. Add the egg mixture. Add the tomato and stir well. 6. Cook the eggs, letting the liquid run to the edges, constantly pulling edges away till almost all liquid is dry. Add the basil and oregano and feta cheese. 7. Gently fold over half the omelette and press gently to seal. 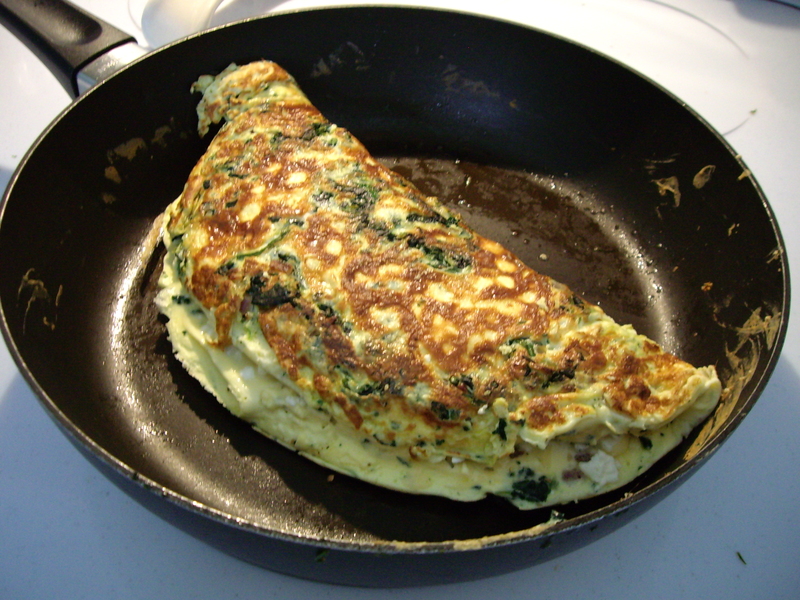 If you wish to flip it go ahead, but this is a large omelette and it may be hard to do. 8. Cut in half and serve! 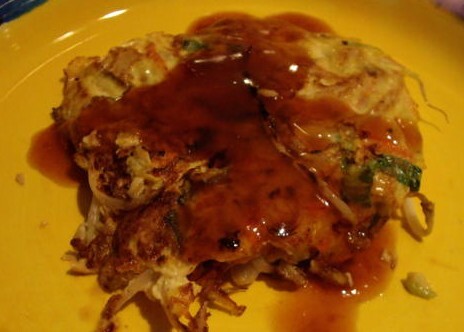 Egg Foo Young is a really good chinese dish. But I know how high in calories it can be so I usually stay away from it. My husband loves it too and usually gets the pork variety. This recipe can be made with pork, chicken, ham, or shrimp. Pretty much any protein you want to put in will work just fine. I took parts of this recipe from a Rachael Ray recipe as well as another recipe I had found. I left out what I didn’t like (yes, peppers! Eww…) and added my own touch. Another high calorie part of this recipe can be the sauce. Not in this recipe. 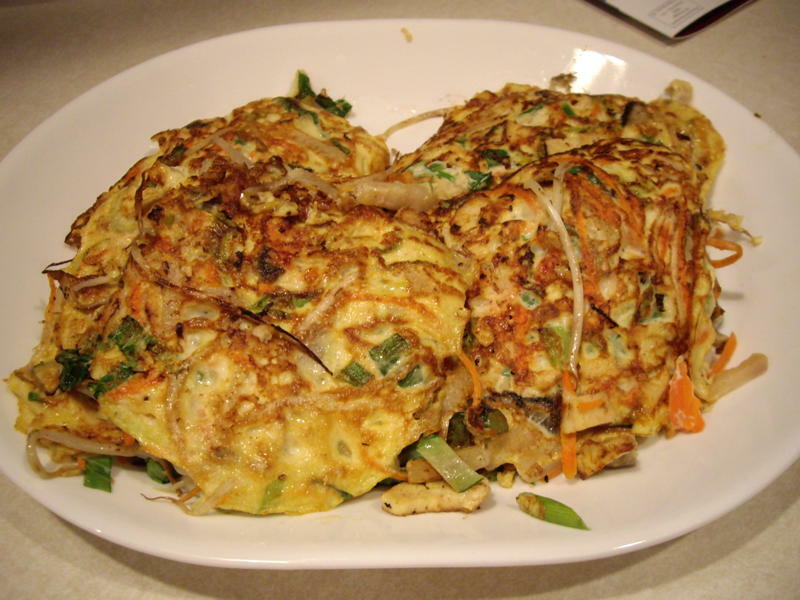 There are a lot of ingredients and it does look daunting but give it a try. It’s not difficult and it will taste incredible! And it looks so good doesn’t it! 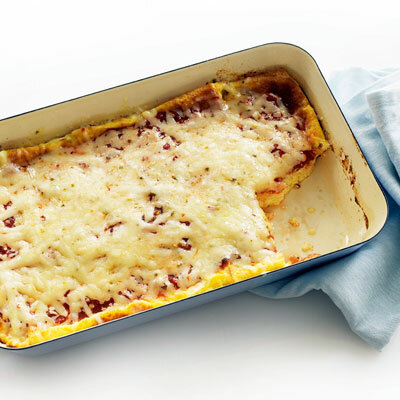 If there are any leftovers they make a great breakfast too! 1. Preheat a griddle pan over medium heat and brush it with some olive oil. 2. In a large mixing bowl pour in the egg beaters, chicken, bean sprouts, carrots, mushrooms, bok choy, water chestnuts, scallions, grated ginger and garlic. Season with salt and pepper and mix until completely combined. 4. In the meantime, combine the cornstarch with a splash of chicken broth/stock to dissolve it. Place the rest of the stock/broth, tamari, cornstarch, hot sauce and sliced ginger in a small pot. Bring to a boil and stir until thickened for about 3 minutes or until you can coat a spoon with it. Remove the sliced ginger and remove from heat. 5. Serve 2 pancakes per person with gravy poured over the top.